Every so often we put together an article that compiles some of the feedback and reviews that our students frequently email us. 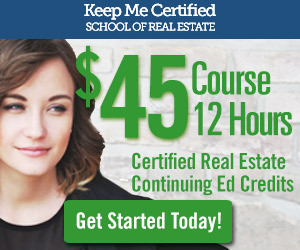 Keep Me Certified real estate school sees hundreds of students complete our online ce course each month. Real Estate School reviews aren’t easy to find so we wanted to make our reviews as transparent and accessible as we can. We try to interact with many of our students and more importantly we always solicit their feedback. Our inbox has a consistent stream of messages from our students who go out of their way to write us a note. Here are a few reviews we have recently received. “I just wanted to let you know that I found your education programs to be very informative and worthwhile. Its good to get refreshed on what we learn through out our day to day business, and on the things we “might” forget. Michael does an excellent job, and I give him high marks. Thank you for providing this online format. It works quite well for any busy agent.” -Augusta T.
“Very well done, I enjoyed the course” -Rita G.
“Thank you for providing this service. It was well done , very informative and convenient.” -Marie M.
“Hi, i just completed on my 12 hours online continuing education thru your online program and i must say that this is not only “THE BEST” program you have but it is also very convenient to complete the continuing education for any real estate professional. Not only i will be your permanent customer from now on but i will definitely recommend it to just any other real estate professional here in the Boston area! Oh by the way, your price is very reasonable comparing to other people in this industry. Thank you for well done job!” -Jaswinder S.
For more reviews, check out the Keep Me Certified Google Plus page. If you’re ready to start our course, check us out and register at keepmecertified.com. Thank you for supporting your local, Boston based real estate school.